Welcome back to the second to last edition of this six part blog. Thank you to all those who read last week's NL East preview. With just two divisions left, today I will be previewing the ever so eventful National League Central today, home of the Milwaukee Brewers, St. Louis Cardinals, Chicago Cubs, etc. Each team for the most part had something (or some things) occur that altered its franchise forever. I also promised a shocking prediction for this division. So, let's jump right into one of the bigger headlines. Ryan Braun of the Milwaukee Brewers was slated to face a fifty game suspension for testing positive for performance enhancing drugs. Upon an appeal by Braun, he was relinquished of all accusations because of a technicality in the case and will be able to play all of the 2012 season. However, this wasn't the only headline circling Milwaukee this offseason. 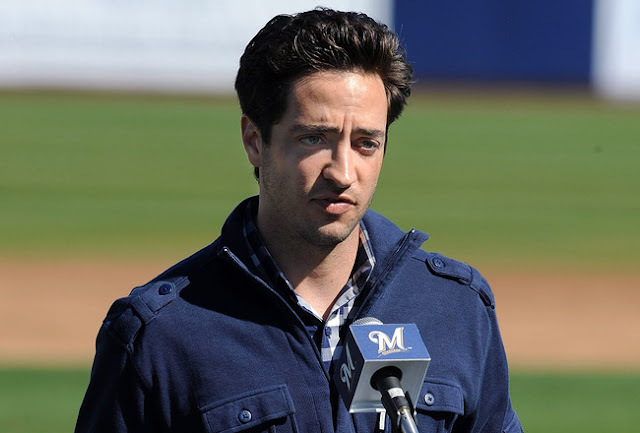 Ryan Braun addresses the media, Brewers front office, and teammates in press conference following exoneration. On January 24th, 2012 (my birthday nonetheless), the most talked about question for a while during the offseason was finally answered. Prince Fielder had landed in Detroit to play for the Tigers. After Victor Martinez was unfortunately injured and forced into season ending knee surgery, the Tigers has to make a move...and they did. With Prince Fielder gone, the biggest question that arises for Milwaukee is how to make up for the loss of Prince? Well, here's how. The Brewers possess one of the better if not best starting rotations in the National League, hanging with clubs like St. Louis, Washington, and San Fransisco. Zack Greinke and Yovani Gallardo sit at the top as the Brewer's two aces. In the middle sits veteran Randy Wolf, who is having an outstanding spring so far. Bringing up the bottom of the rotation is Shaun Marcum, who had a very rough post season for the Brewers tagged with injuries this spring, and lefty Chris Narveson, who seems to being coming into his own. If these five guys can stay healthy, they can definitely make up for some slack they lose with Prince by preserving leads, especially with the best bullpen combo in the National League of Fransisco Rodriguez and closer John Axford. The Brewer's number one goal this offseason was improving the left side of the infield, but at the same time keeping some power in the line-up to replace Prince in the clean up spot. Brewer's GM Doug Melvin received a phone call from then Cubs free-agent third baseman Aramis Ramirez and proclaimed to Doug that he wanted to play for the Brewers. Doug then took that information to owner Mark Attanasio and coach Ron Roenicke, and shortly after they brought in the right handed batter. The Brewers also got the defensive glove of Alex Gonzalez at shortstop, who is the former Braves infielder and a much needed improvement the Crew needed. The final move Milwaukee made in the offseason was winning a bid on Japanese outfielder Norichika Aoki, who later signed a two year contract with Milwaukee. Final Thoughts: With the freak injuries suffered to Corey Hart this offseason, expect him to miss at least the first series of the season, thus Nori Aoki in right field. With the Brewers lossing the talents of Prince Fielder, LaTroy Hawkins, Takashi Saito, Jerry Hairston Jr., the Brewers will look to their farm system and offseason signings to fill the roles. If each individual player can make a difference, I don't think the Brewers will have any problem doing the same amount of damage as they did in 2011. You take out power and add in speed and defense, you can have a just as successful team. The St. Louis Cardinals were also in the news this offseason, but unfortunately for them, for the wrong reasons. Shortly after being honored in St. Louis with his own statue, free agent first baseman Albert Pujols packed his bags and headed out West to the L.A. Angels to sign a monster deal. So, the search was on for the Cardinals to find some sort of replacement for Albert. The one big move offensively was acquiring outfielder Carlos Beltran. Carlos Beltran walks with coach Mark McGuire before a game in Jupiter, FL. Cardinal's GM John Mozeliak and manager Mike Matheny want Tyler Greene to make it as their second baseman because the 28-year-old has power and speed and is out of options. He probably will lead off early in the season, at least against left-handed pitching, so that he can see better pitches than if he hits eighth. World Series hero David Freese will hit fourth against left-handers and first baseman Lance Berkman fifth. Matt Holliday will hit third, where former first baseman Albert Pujols hit for the last ten seasons. Final Thoughts: I think the Cardinals hurt more by losing Pujols then the Brewers by losing Prince. Not taking anything away from Prince, either. The Cardinals will enter a season for the first time in twelve years without Albert Pujols, a three-time National League Most Valuable Player. 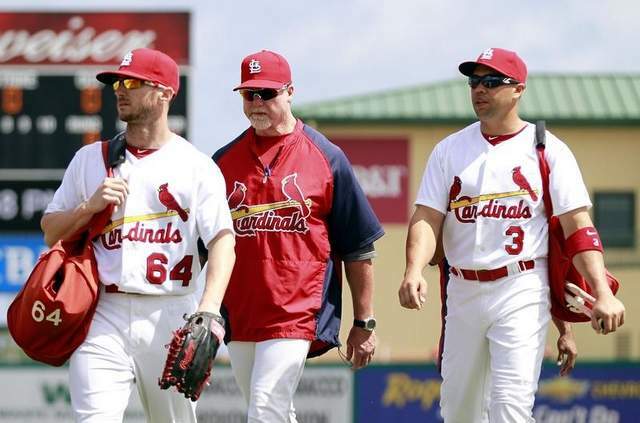 The club would seem still to have a good offense lead by left fielder Matt Holliday and Lance Berkman, who has moved from right field to first base. But no offense really can overcome the loss of a Pujols. New Chicago Cubs manager Dale Sveum spent an uneventful spring getting to know his players and coming away satisfied that they had given full effort and had played smart baseball. The Cubs, winners of seventy-one games last year, still have plenty of question marks about whether the offense will produce and how new faces will fit into the starting rotation. New faces at first base, Bryan LaHair, and third base, Ian Stewart, will try to fill the offensive void left by Carlos Pena and Aramis Ramirez. Ryan Dempster, shockingly to some, won the Opening Day start over Matt Garza, who emerged last year as the team's best starter. Dale Sveum named his one, two and five starters first and saved the third and fourth spots for last. Paul Maholm gives the Cubs their first full-time rotation lefty since Ted Lilly was traded in July 2010. Samardzija looks to have pitched himself from the bullpen and into the rotation with a strong spring. The final spot will come down to a battle between newcomer Chris Volstad (obtained from Miami in the Carlos Zambrano trade) and Randy Wells, and inconsistent holdover from the previous two seasons. Closer Carlos Marmol had an up-and-down spring, prompting a little chat with Sveum. Final Thoughts: The Chicago Cubs definitely lit up the headlines this offseason with signing new President of Baseball Operations Theo Epstein. Though not contenders now, the Cubs will be led by Theo and his team to help rebuild and construct a winning team again on the Northside of Chicago. 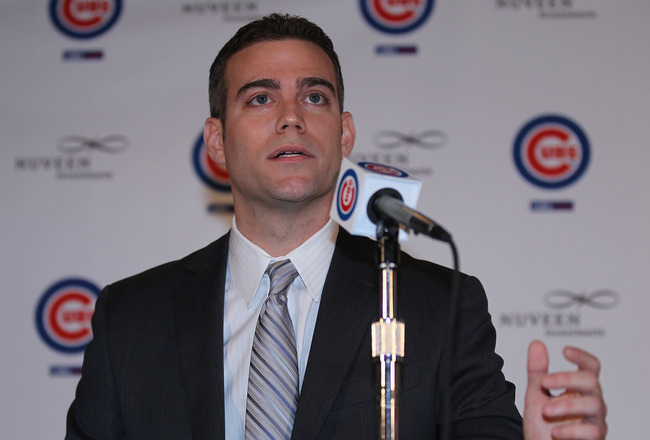 Theo Epstein addresses media at his inaugural presser in Chicago. The Cincinnati Reds offseason was mainly focused on improving their starting pitching. Mat Latos, the big offseason acquisition, looked great in camp. The Reds gave up a lot to get Latos from the Padres, but many see the move still more beneficial to the reds. He only allowed three runs over his first four starts. Johnny Cueto, who began last year on the disabled list with biceps tendinitis, is healthy and pitching well going into this final week of spring ball. 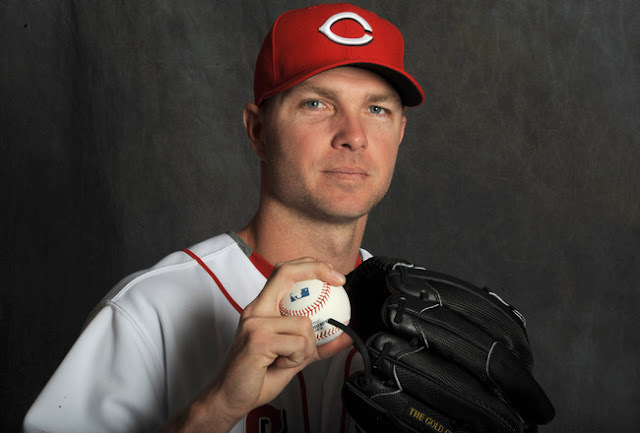 The only thing that shook it up was that RHP Ryan Madson, the new closer, had a setback in his recovery from a sore elbow two weeks before Opening Day, and will miss the entire 2012 season. Sean Marshall likely will close in place of Ryan Madson, with Aroldis Chapman there if needed. Nick Masset and Bill Bray are dealing with injuries, so the Red's bullpen looks extremely thin. The Reds are hoping the young right-handers, Logan Ondrusek and Jose Arredondo, can stay healthy. Both had 3.23 ERAs, but both spent time on the disabled list. Red's newly acquired closer will be out for the 2012 season with Tommy John's surgery. Final Thoughts: The Reds came to spring training with a very set roster and there were no big surprises. The best news of camp was how healthy and productive Scott Rolen was. Plus, their starting rotation is much improved and ready to go. Unfortunately, with the loss of Madson, I think they lost their bid to win this division. The Pittsburgh Pirates had a spring in which they were mostly healthy, minus the broken orbital bone of RHP A.J. Burnett that should keep him out until May at the soonest. The pitching has looked fine, as has some of the hitting from a reconfigured bench, but the defense and fundamentals have been sorely lacking. Furthermore, nine of their first twelve games are on the road. It's going to be a tough test for this soon to be promising team to start the season. A.J. Burnett, Erik Bedard, Kevin Correia and Jeff Karstens are known commodities, but the same can't be said for Charlie Morton and James McDonald, the wild cards in the rotation. The Pirates continue to hope for two left-handers in the bullpen, but that seems unlikely with only Tony Watson pitching well in the spring. Management is seeking help here from the outside if Evan Meek's recovery from shoulder trouble in 2011 continues. His fastball was back up to 94 mph by the third week of March, and that will solve the issue of a setup man for the 40-save closer Joel Hanrahan. If it doesn't, Chris Resop or Jason Grilli could be pressed into that role. Daniel McCutchen established himself as a good long man last summer before being overused. 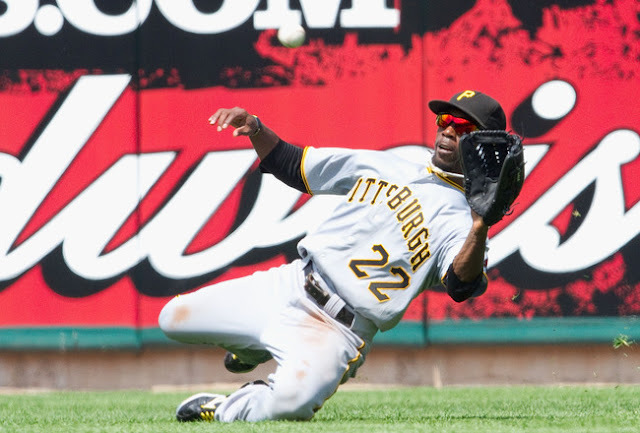 Pirates CF Andrew McCutchen making a diving catch in spring ball. Final Thoughts: The main problem for this team comes with a bottom half of the order in which no one batted as high as .250 last year. There's some pop with Jones and Barajas, but Alvarez has miles to go at the plate. There could be some quick innings down there. The Pirates have prioritized offense over defense in building the bench, and they're hopeful that having various options will help undo the sub-.250 component of the bottom half of the regular lineup. That will be underscored if McGehee ends up taking Alvarez's place. Nice try, again, Pitt. But, you still aren't there yet. As the Houston Astros look to recover from a league-worst 106-loss season in 2011, the starting rotation looks to be at it's best in years, which actually isn't saying much. Kyle Weiland, acquired along with SS Jed Lowrie in the trade for RHP Mark Melancon, is hardly a lock. The Astros could still go with RHP Jordan Lyles, their top pitching prospect in 2011 who struggled a bit upon debuting. No matter who starts, it is expected to be a fluid situation over the course of the season. Lyles has little else to accomplish in Triple-A and is seen as a starter long into the future. And RHP Paul Clemens, who wowed the Astros in spring training before being sent down, appeared like he'd be ready at some point in 2012. The only major change from the beginning of spring is the addition of Chris Johnson, who had a great spring after losing his spot to Jimmy Paredes in 2011. When Paredes was injured at the beginning of spring and new management wanted to move him back to second base, he went back to the minors and an opportunity for Johnson. At the beginning of spring, it was thought that the player who could move the most within the lineup would be Jed Lowrie, and this has been the case. He's gone up to the No. 2 spot, while Jose Altuve has dropped. The Astros have liked most of Jose Altuve's skill set for the top of the order, so if he can find a way to draw walks and get on base more, he could reverse his personal downward trend. Final Thoughts: Perhaps the best news for the Astros this spring is that this is the last year they will get destroyed by the NL Central teams of the Brewers, Cardinals, and Reds. The bad news, they are heading to the AL West to get demolished by the Rangers and Angels. Who knows, maybe the DH spot will get them a World Series again. Until then, happy rebuilding! 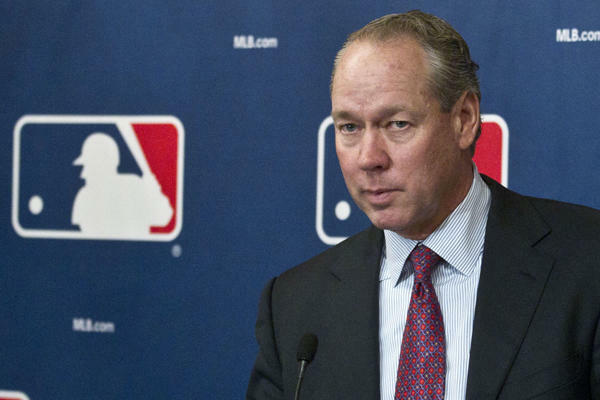 Astro's owner Jim Crane addresses the media after announcing the Astros move to the AL West in 2013. And that does it! Next week I will preview the National League West to wrap up the 2012 MLB season preview series. Thank you for reading, I hope everyone enjoys reading this. Please leave your thoughts on here or on the Twitter feed (@WISportsBlog) if you agree, disagree, or want to make a point. I look forward to reading your comments.